August if you are interested in giving it a whirl. you, it would not have run as smoothly. There will be a summary at the May meeting. auction held this year on April 8.
before he could give it to them. from Betty Wilson at each Tuesday carve and monthly meeting. woodcarving exhibition currently on view through May 21, 2017 jmkac.org/exhibitions/theroadlesstraveled/ames-zahn.html. were expenses of $714.87 and income at $400.00. Expenses included rent to Generations and insurance for the show. England, and Wildfowl Competition 2016. Sunshine Report. Mary Nowacki would like members to contact her if cards need to be sent. Saturday Carve. The project for April 15 will be carving ornaments for the Meals on Wheels tree. event, to sell raffle tickets, to take admission, to help with judging, and to man the club table. numbers to members who had previously booked a table. The remaining numbers will be handed out at the show. the exhibitor door directing attendees to use the front entrance. ask friends to spread the word. many ornaments, which will be collected until the November meeting. Unity Music Festival. 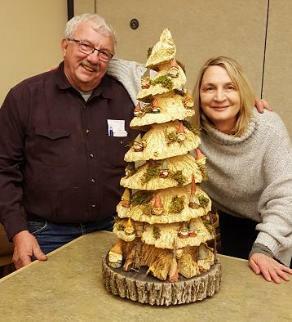 Don Lorier will donate a tree decorated with gnomes carved by Pam Moir to this event held on April 8.
willow walking stick. Both items will be part of the silent auction. interested. There are still openings in the class. Mini Lathe. Jerry Bauer brought a mini lathe that he wanted to sell to the meeting. Show & Tell. Thirteen members participated in the Show & Tell portion of the meeting showing a wide variety of carvings. were won by Rose Mohnsam. be raffled again, and the final winner was Rose Mohnsam. The carving knife was won by Henry Meller. Jim adjourned the meeting at 7:39 pm. 9 am-4 pm; go to richfieldhistoricalsociety.org. 1301 Craig Avenue, Janesville, WI; 10 am-4 pm, rosietom@centurytel.net, 608-868-4522, or rockrivervalleycarvers.com. Next meeting: May 3 at Generations in Plymouth, Wisconsin, 6:30 p.m.